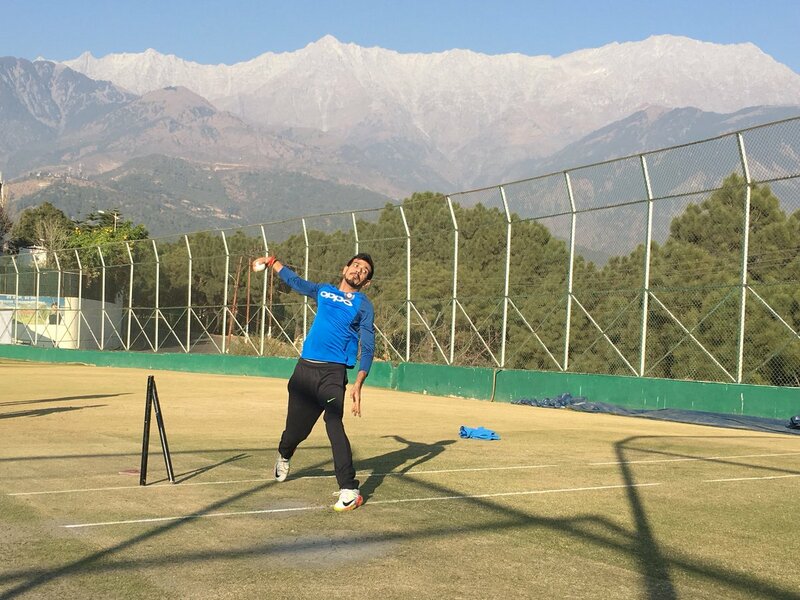 Dharamsala, Dec 10: India will aim to extend their dominance sans regular skipper Virat Kohli when they face Sri Lanka in the opener of the three-match One-day International rubber at the HPCA Stadium here on today. Kohli had asked for a break ahead of the challenging tour to South Africa later this month and, in his absence, vice captain Rohit Sharma will take over the reins of the Men in Blue. With predictions of widespread rain and snow threatening the opener, the toss could play a crucial role in the outcome of the tie. Having won five straight bilateral series apart from reaching Champions Trophy final, a 3-0 win will put India atop the ICC ODI rankings, overtaking South Africa. The last time India faced Sri Lanka in one-dayers, it swept aside the island nation 5-0. Going into the contest, the Sri Lankans will need to deal with a formidable batting line-up comprising Rohit, Ajinkya Rahane, Dinesh Karthik, Mahendra Singh Dhoni and Kedar Jadhav. However, if Dhawan, who was down with viral fever on Friday, pulls out then Rahane could be seen opening the innings. It will be a sweet headache for the team management to choose between Manish Pandey and Shreyas Iyer, in case Jadhav also misses the opening tie due to a hamstring injury. All-rounder Hardik Pandya will continue to be a vital cog in India's wheel as he completes what has been an exceptional year in international cricket for him. The bowling department will be led by the pace duo of Bhuvneshwar Kumar and Jasprit Bumrah while Pandya will provide the services of the third seamer. It will be interesting to see if rookie Siddharth Kaul is included in the playing XI at the HPCA Stadium, which is expected to aid swing bowling. With the conditions favouring the seamers, it looks highly likely that India could go in with one specialist wrist spinner between Yuzvendra Chahal and Kuldeep Yadav despite having an extra finger-spin option in Axar Patel. On the other hand, fresh from a great fightback which saw them drawing the third Test in New Delhi, the Sri Lankans will expect their senior players in Angelo Mathews and Upul Tharanga to lead the way. For the islanders, the return of Kusal Perera and Asela Gunaratne after recovering from injuries will bolster their middle order. The tourists will bank on young batsman Dhananjaya de Silva, who scored a fighting century in the third Test to force a draw in Delhi. India: Rohit Sharma (Captain), Shikhar Dhawan, Ajinkya Rahane, Shreyas Iyer, Manish Pandey, Kedar Jadhav, Dinesh Karthik, Mahendra Singh Dhoni (WK), Hardik Pandya, Axar Patel, Kuldeep Yadav, Yuzvendra Chahal, Jasprit Bumrah, Bhuvneshwar Kumar, Siddarth Kaul. Sri Lanka: Thisara Perera (Captain), Upul Tharanga, Danushka Gunathilaka, Lahiru Thirimanne, Angelo Mathews, Asela Gunaratne, Niroshan Dickwella (WK), Chaturanga de Silva, Akila Dananjaya, Suranga Lakmal, Nuwan Pradeep, Sadeera Samarawickrama, Dhananjaya de Silva, Dushmantha Chameera, Sachith Pathirana, Kusal Perera.